You are warmly invited to a cocktail preview of the SID-SMU Directorship Programme (SDP) jointly organised by SID and SMU. 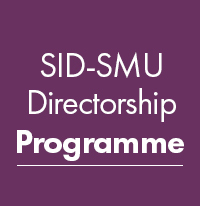 The SID-SMU Directorship Programme was launched in 2007, the first local director training programme with formal certification. Set within an Asian Context, the six-module programme comprises lectures, case studies, role- plays and board simulation exercises conducted by expert faculty and industry professionals. The programme is organised in two tiers. Participants can obtain an Executive Diploma in Directorship by completing all six assessable modules successfully. Participants can choose to complete the first three modules and obtain an Executive Certificate in Directorship. Graduates from the Programme may be admitted to SMU’s Executive Development Alumni Association. If you are interested to enhance your board level skills and ability to lead in challenging times, we encourage you to sign up for the advanced programme in directorship. To find out more about the SID-SMU Directorship Programme, please join us for our Cocktail Preview, where expert faculty and past participants will be on hand to share highlights of the programme and address your queries.